Now the Gladers are fighting WCKD to eradicate all the Cranks stricken with the Flare. Confused? Then stop right here. Seriously. Bye. Maze Runner: The Death Cure, the uneven and unwieldy finale to the dystopian Us-against-Them trilogy, is strictly for fans that have journeyed this far and need certain closure. Though set in a post-apocalyptic universe, the Maze Runner has always reeked of 2012. Like The Hunger Games, Divergent, The Giver and more, the saga — adapted from James Dashner’s YA novels — features teens running around in a barren dystopia and trying to rebel against a sinister organization, i.e., “WCKD.” There is A Chosen One, of course. But, sigh, it’s a brooding male named Thomas (Dylan O’Brien). How reductive. Katniss Everdeen could taken this guy out with one well-placed arrow. Over the course of two films, Thomas and his cohorts, i.e., “The Gladers,” have survived a deadly maze and attacks from zombies, i.e., “The Cranks.” The group now realizes they’re in this mess because they’re immune to a disease, i.e., “The Flare,” wiping out the civilization. Part Three extends the story without managing to do anything surprising or eye-popping that hasn’t been done already in previous chapters or similarly themed films. And it accomplishes this disappointing feat in a whopping 144 minutes. Enough recap. Franchise director Wes Ball isn’t interested in making The Death Cure a self-contained film that caters to the uninformed, so I’ll follow suit. After all, the very first scene features the main characters in mid-chase in the desert wasteland. You either latch on immediately or you’re lost in the wasteland of the plot. (Where’s a Star Wars explanatory opening crawl when you need one?) Our hero, along with Newt (Thomas Brodie Sangster), Brenda (Rosa Salazar) and Frypan (Dexter Darden), are a faction, while a captured Minho (Ki Hong Lee) is being held captive. A human guinea pig, he’s being experimented on in hopes that his immune blood holds the cure to the zombie virus. In a quest to rescue their pal and stop the organization’s cruel activities, the Gladers decide to infiltrate the WCKD headquarters, located in the sleek, shiny and walled-off metropolis known as “The Last City.” But unlike the original Maze Runner, in which they tried to find a way out, they need to get creative to find a way in. They’ll get help from a familiar face and a virus-infected resistance fighter (Walter Goggins). 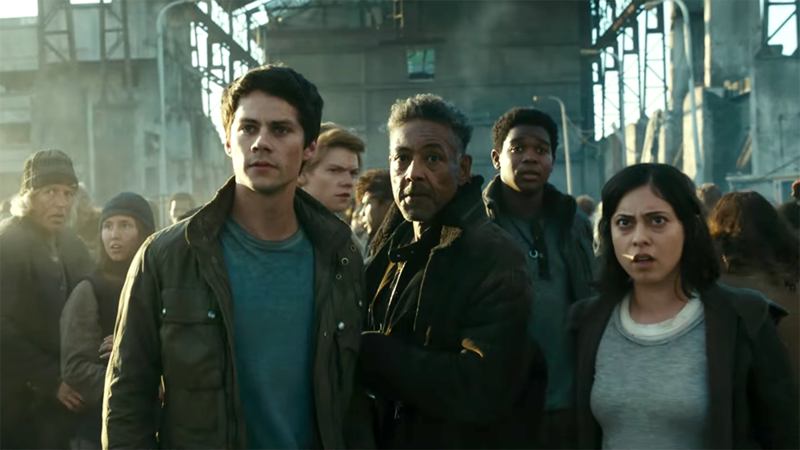 Meanwhile, WCKD’s head honcho (Patricia Clarkson) is monitoring their moves, and Thomas’ onetime ally, Teresa (Kaya Scodelario) — who betrayed the Gladers and now works for the baddies — remains wildly mistrustful. Damn her honest-looking face! To its credit, Thomas & Co. don’t make bone-headed decisions or talk in genre clichés. O’Brien lacks the forceful screen presence of dystopian peers Jennifer Lawrence or Shailene Woodley, but he gets the job done. And the moral quandary in play — is it fair to make the smaller good suffer in the name of the greater good? — has merit. Unfortunately, the name of the game is big, bad action set pieces. There will be gun-slinging violence and explosions and, just for good measure, a sequence involving a bus full of innocent kids and a crane. All of It becomes mind-numbing after the two-hour mark. The whams and bams supersede all aspects of the story’s logic. I haven’t read the source material, but riddle me this: If Thomas’ blood is so super-special, then why didn’t WCKD just draw it from the beginning? What was the real point of the maze? Why are the Gladers tortured anyway? Can’t they just pull a Red Cross and draw blood the old-fashioned way? Most important: Where did Brenda get that perfectly fitted chic sweater? If this thriller were truly thrilling, audiences would not have to feel like they’re the ones running circles in a maze.